OP no need to get mad ,it was pointed out there are technology advancements just not in the things you want like flying cars ,wearing jetpacks, eating food pills, living on the moon or mars, underwater ,starship ,warp drive ,real space program , real force fields ,star trek phasers or star trek replicator. These things are discovered very hard to make. And in the future many of these things may never be possible because of the laws of physics. Now if you had anti-gravity than I see why not big starships,flying cars or jetpacks.But we have not discovered anti-gravity or know how to make anti-gravity. Not to sound like a conspiracy theorist, but flying cars may exist, but we just don't know about them. Having access to them in movies has fulfilled our desire for them. Much easier. 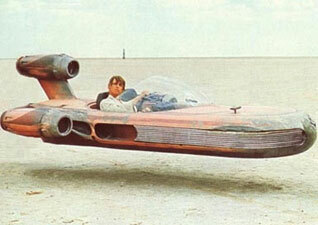 I think a hover car like in star wars would be more practical in the future but the problem is engines today are not powerful enough and very loud. May be in 50 or 100 years from now. I could see a flying car something like that or Neo soul in about 50-100 years. Well, for one thing, we found out that food pills weren't that great for the lower intestine. They also don't taste as good as a grilled T-bone. That is what I hope the future is going to look like. So I would like to know, its 2014 why is it that we are still not driving flying cars, wearing jetpacks, eating food pills, living on the moon, and underwater, where is my wrist watch TV, my nuclear powered vacuum cleaner, my virtual reality headset, my holodeck and holograms? I thought we were supposed to be in the future by now. Oh well, I guess I will have to make do with computers, iPhones and video games. I this day and age, I believe that a lot is limited not necessarily about our capabilities, but rather funding. If there is an interest for such things, it will be made by someone with a lot of money to make more money. If such a thing cannot be profit from, however, it will be developed much, much, much more slowly. For example, pharmaceutical companies do not even bother to do any kind of research into diseases that affect relatively few people simply due to lack of potential profits. Sure, there can be government grants, but what are a few million dollars in grants compared to a multi-billion dollar pharmaceutical company? Good point. There are both positives and negatives to capitalism. What you brought up is definitely one of the main negatives. If you can't make a profit, why invest in it?